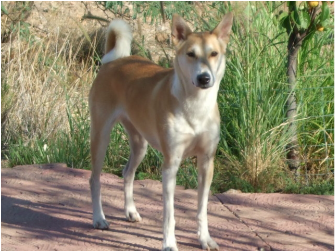 Breeding to preserve the bloodline of the ancient, natural Canaan Dog. Sufat Sheleg Ziva bat Ash (Ziva) my Canadian princess. Lucas, Ziva's son, is my thoughtful, sweet boy. FarSight Maccabee bat Onyx (Ms. Maccabee) doing her horizontal Snoopy dance. Kol Tuv Jochebed (Della) at 8 weeks, my little gremlin girl. Della joined her mom,dad and beloved uncle Nathan at the Rainbow Bridge on 8/24/2016. Run free gangsta girl!! Ellie's name means "One Candle for Maccabee" in Hebrew. I look forward to the adventures I'll share with this stunning little girl. FarSight Nathan (Nathan) my backyard Champion. Nathan crossed the Rainbow Bridge on 11/23/11. RIP Handsome.